This guy showed up in my workshop a few weeks back. His owner asked me to remove the clown makeup and restore him to his former self, whatever that was. 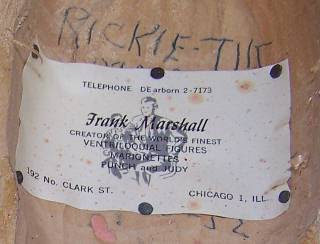 A peek inside the mouth at a stapled-in business card revealed that he is a Frank Marshall figure. 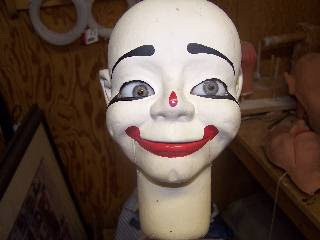 According to the seller, a previous owner repainted the figure as a clown some many years ago. 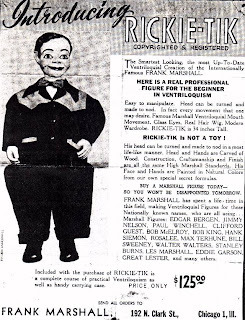 Opening his head, we discovered that the figure is a Frank Marshall Rickie-Tik built in 1952. That's what is written in pencil under the card. This was a significant discovery. The new owner had wanted one of these when he was a boy. But the $125 price was too high according to his parents. Here's the brochure that Marshall sent out. Opening the head revealed that Marhsall's original jaw pulley had long ago given way to the pressure of the strong jaw spring and come out. Someone had replaced it with a homemade pulley contrived of a dowel and two nails. The original string was frayed. 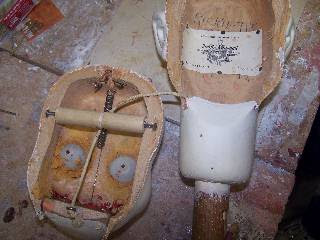 The glass eyes, which may or may not be original, were held in place with Plastic Wood and one of them was off center. I removed all the innards and took out the eyes. I found out why the little guy was crosseyed. When repainting the head, the painter slopped paint on the whites of the eyes. Instead of removing and cleaning them, he simply shifted the eyes' rotations to hide the paint. Those glass eyes are fragile like a light bulb. One of them shattered during the cleanup process. The owner preferred brown eyes anyway, so I studied pictures of other Rickie-Tiks, and installed suitable brown eyes. The glass eyes were oval and didn't fit well. But 1.25" wooden spheres fit perfectly in the eye sockets, which makes me wonder whether those particular glass eyes were original. I removed the dowel pulley and installed a metal pulley where the original one had been, but with much better support than Marshall had used. This one won't come loose. A new nylon string the same thickness as the original will last for another half century at least. I stripped the white paint from the head and hands revealing the original flesh tone, which had soaked deeply in the wood years ago but which was now marred by the stripping and sanding process. It was oil paint. Acrylic paint will not adhere over oils. I used a special acrylic-on-oil formula, which the great figure maker Ray Guyll invented. It worked fine. I studied pictures of Rickie-Tiks from my collection and from pictures provided by other owners. Marshall used various styles for painting eyeshadow, blush, lip shapes, and eyebrow width and placement. I chose the style I liked best, one that seems to be most like the picture in the brochure. Matching the original flesh tone was made easy for me. Marshall spilled some drops inside the head next to his card. Finding the wig was next. The clown was bald. Monique Trading Corporation has a line of inexpensive doll wigs, and I was able to find one that with a haircut looks much like the wig in the Marshall brochure. The owner is having a suit made like the one in the brochure. A carefully-restored figure, Rickie-Tik is not destined to sit motionless and silent forevermore in some private collection or in a museum. That was not his destiny. 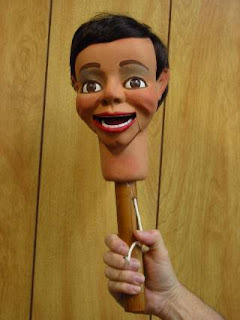 No, he now goes into service as one of the partners of a professional ventriloquist entertaining children by using the dummy he has wanted since he was a little boy.